The new CEPEX EXTREME range offers a fantastic product for use within industrial process and atmospheres. 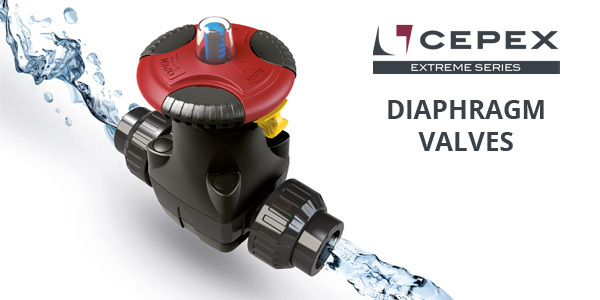 With improved material availability, design, pressure and temperature; the CEPEX EXTREME diaphragm valve is a fantastic option for flow isolation and regulation. Designed for industrial applications in order to provide maximum security and control the flow of your process, with excellent quality. The increased body and sealing materials offer combinations to suit a wide and varied range of processes within the Filtration, Chemical, Energy, Mining, Pharmaceuticals, Water Treatment and renewables industries. With the larger range of body materials available including PVC-U, PVC-C and PP-H combined with EPDM and FPM O-Rings and diaphragms offer excellent flow characteristics across the range. As ever the process should determine the material selection according to chemical compatibility along with pressure and temperature considerations. 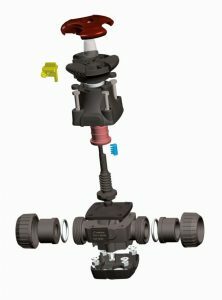 Along with the wider range of materials the valve can now be offered with a much larger range of connections to suit as many applications as possible, including Female and Male (Spigot) Solvent Socket Connections (Metric, ASTM and British Standard), Female Threaded Connections (BSP & NPT), Flanges (PN10/16), Fusion welding for the PP-H valves, and Electrofusion for PE100 spec.